Pub in Borough, run by The Only Pub Co. Inside, the floor is wooden and the wallpaper is flocked, but the impression is more of a modern redecoration with an ironic eye to the past, rather than a traditional decor that hasn't changed for decades. There are a couple of sofas as well as normal chairs and tables, and a flatscreen on one wall. There's also some covered outside seating down the side of the pub. When Kake and bob visited on a Monday evening in March 2011, the flatscreen was playing silently in the wrong aspect ratio, and music was playing, fairly loud. There were quite a few people in, though still a few seats available. 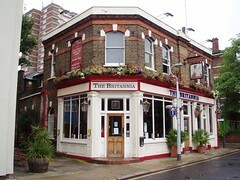 On our March 2011 visit, there were two real ales on: Bombardier (£3.55/pint) and Flowers IPA. However, the drink focus is really on whiskies, a vast array of which is displayed behind the bar and written up on a blackboard. Accessibility: One step up to get in. Not sure about access to the toilets. The pub is quite small inside. Last visited by Kake and bob, March 2011. Last edited 2013-05-10 06:50:03 (version 12; diff). List all versions. Page last edited 2013-05-10 06:50:03 (version 12).